The other night I decided to do an experiment. Not out of boredom, but for a purpose. It’s blog writing time. On several occasions in the past I’ve asked for input from my Facebook friends as research for whatever topic I’m focused on. This time I decided to do my own research for a change. The topic for the week? What is seen in the light. My research experiment? 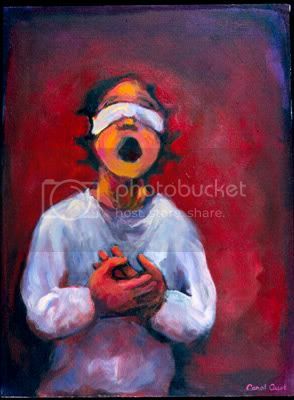 Shut off the lights and put on a blindfold, then write my post. Yes, fellow ponderer, I typed blindfolded. And I did pretty well, too. I say that not to boast; it’s because I have used my typing skills almost daily over the past manymany years, and I don’t like having to go back and edit any more than what is necessary. Here are some of my reflections of my time in the absence of light. I have left out some of what I wrote, simply because the thought was too random, or the flow of thoughts didn’t make sense or repeated what had already been said. However, I have not edited for spelling or typing errors, except where I have added a clarification in (parentheses and italics). Unsure of my surroundings, I do not know what isbehind me, next to me, hovering near me. My vision having failed me, I rely solely on my remaining senses to make sense of my world. Smell – fragrance? Odor? It’s always been here; I never noticed, never needed to notice. Hearing? The tick-toc-tic-oc of the clock on the wall behind me. The time on its face, useless to me; I cannot read the hands, am unaware of w cannot comprehend what they are saying to me. Touch. The slight raises on the F and J keys assure me that I am typing words, not gibberish, on my compu8ter. Many tyupos, I am sure, but not pure gibberish. Taste? The dryness of my mout. The taste of anxiety. Perhaps even fear. The air in the room has a coldness to it, a coldness that ought not be present. Such is the air of being without light. Of darkness. Of bself-imposed blindness. I have spent the pasat 30 minutes or so blindfolded. I can see no light. I cannot see what is seen in the light. I had my office chair in the middle of the room. I spun myself around several times. After I got over the dizziness I stood==. My objective? To find my way in the dark. What made it hard? I had no point of reference. I did not know where I was; where I was heading. I –Walking through my house I have had a heightened awareness of my surroundings. Not because of what I could see. --, but because of the obstacles I could not see. The doorways, the moving boxes scattered throughout the house, some with box flaps hanging open. The coffee table. Light is meaningless, until I surrender my blindness to it. Jesus is meaningless to those who do not surrender their blindness to him. How long? How long must I stay blinded? When will I see light? Jesus healed the blind nman at the city gate. Bartimaeus. Jesus stopped and said, “Call him over!” They called out to the blind man and said, “Don’t be afraid! Come on! He is calling for you.” The man threw off his coat as he jumped up and ran to Jesus. Jesus told him, “You may go. Your eyes are healed because of your faith.” Right away the man could see, and he went down the road with Jesus. Jesus, my experiment and reflections are showing me how lost and alonde I am without you, when I place myself in self-imposed darkness. Like Bartimaeus, I want to see. More than seeing, I want to help others to see. To help them to see their darkness, to bring them into light. My physical darkness is easy to change, to turn around, to repent of. Once I make that change the light next to me will then mean something, make sense. Spiritual darkness, emotional darkness, is not total, unless it iss chosen. Jesus, You are light of the world. You tell us that we too are the light of the world. I want you to help me to help someone in darkness to make sense of Your Light. But Lord, that means revisiting the darkness (my darkness). I didn’t like it there. I don’t like going back. I still am wearing a blindfold. Yet I know there is a light next to me. And the light somehow makes sense in the dark. What is seen in the light is making sense.